I started writing cocktail Friday posts almost 6 years ago over on Tokyo Terrace. It tapered off for a while when I was pregnant with my son, but when I started Set the Table I knew I had to bring it back. One aspect of cocktail crafting I've fallen in love with is using seasonal ingredients to make a flavorful and beautiful drink. From fresh herbs like piney rosemary and citrusy thyme, to fresh fruits like tart cranberries and sweet grapes, the combinations are endless. To learn more about cocktails and how to build the perfect drink, it's important to read and try different recipes. I have a few great cocktail books that have taught me a lot, but the newest addition to my collection is called Shake. 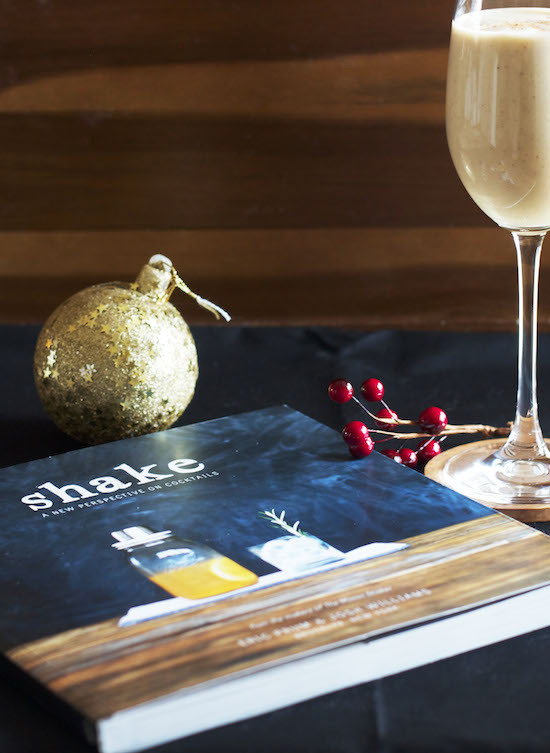 Filled with beautiful photos, easy and unique recipes, and with a seasonal focus, this book is a great gift idea for your cocktail-inclined family and friends. I chose to feature their recipe for a drink called The Nog. Rather than making your own eggnog, the recipe calls for vanilla ice cream flavored with cinnamon and nutmeg. And of course, the drink is spiked with some bourbon and rum. Shake it up and you've got a delicious holiday cocktail that is sure to impress. Because I had some eggnog on hand I altered the recipe slightly and added a bit to the cocktail. I felt the texture of the ice cream was important in the end, so I did half ice cream and half nog. I also only used bourbon since I didn't have any rum around. That's another great thing about cocktails- you can always change them up based on what you have. As long as the ratios remain consistent so that the flavors are balanced, you are good to go! So, if you're looking for a last minute gift idea, Shake is a great one. You could also pair it with the mason jar shaker, which the authors of the book created. Perfect stocking stuffer! Put the bourbon (and rum, if using), ice cream and spices in a cocktail shaker. Shake vigorously for about 10 seconds. Strain the cocktail into chilled glasses and garnish with additional ground nutmeg.